Sidney and I just didn’t eat pizza this weekend. 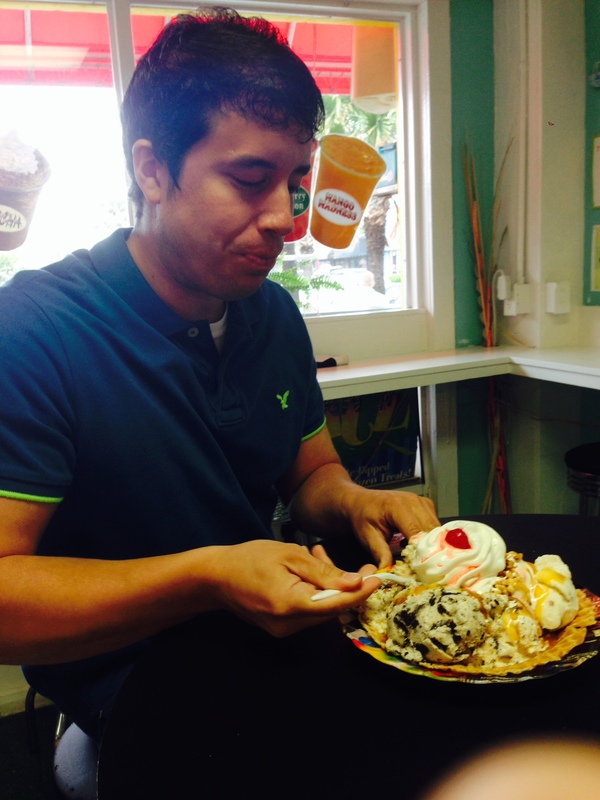 We packed on the calories by indulging in another beloved treat as well: ice cream. Because I love ice cream, I naturally like all the recent industry gimmicks such as Dippin Dots, froyo, and ice cream prepared on stone/marble. As long as it is cold enough to induce a brain freeze, I don’t mind if it is a couple scoops of the classic stuff served in a cone or a cup containing a mixture of flavors and toppings weighed on a scale. This past Saturday, just a couple hours after our MOD Pizza experience, we tried the newest ice cream craze. Not really craving ice cream since we were still full, we went inside of Sub Zero Ice Cream just out of plain curiosity. Sidney and I visited the Myrtle Beach Sub Zero Ice Cream shop on Saturday. Sub Zero Ice Cream puts quite the spin on the classic dessert. You order which flavor of ice cream you want along with the mix-ins desired at the counter. Then, the magic occurs. The staff makes your order right in front of you by using the science of liquid nitrogen. Let me back up and explain this process a little better by using our order as an example. Because Sid and I were so full from lunch, we decided to just split a regular sized cup. Although Sub Zero has several creations with many mix-ins available for customers to choose from, we decided to go simple. We wanted just vanilla ice cream and Oreo cookies. But even the simple is complex. We now had to decide what type of cream we wanted as our ice cream base. Given options such as low-fat, vegan, yogurt, lactose-free, and more, we chose original. The staff member poured the cream into a big silver bowl, added the Oreos, and then placed it under a liquid nitrogen shower/gun contraption. As the nitrogen engulfed the cream, puffs of vapor rose up, creating a pretty cool scene. After a couple more shots with the gun and after some serious mixing, our ice cream was ready. 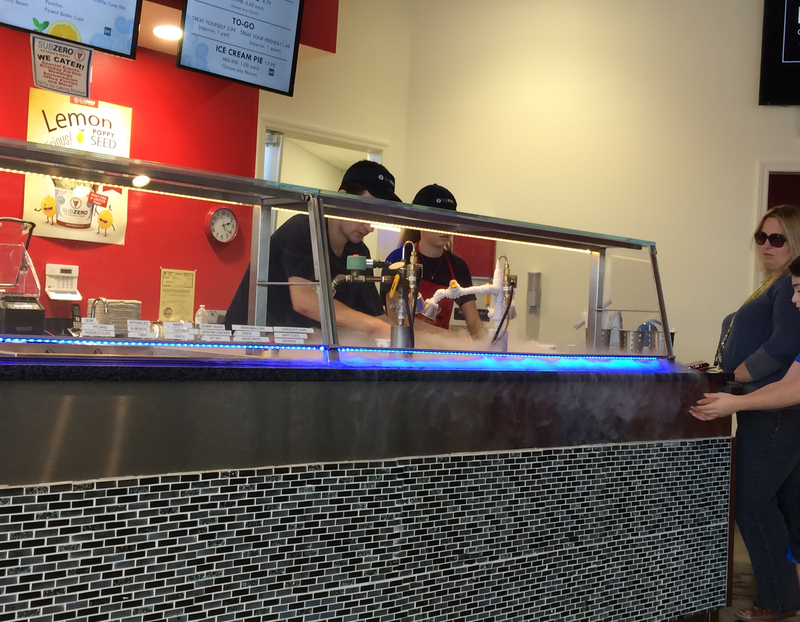 A look at the set up behind the counter at the Myrtle Beach Sub Zero Ice Cream location. If you look to the left, you can see the staff member pouring the cream into the silver bowl. As I paid for our dessert at the counter (it was around $5.50), I thought to myself how it was pretty cool that basic liquid cream could be turned into actual ice cream in just a couple minutes. With the cup now in front of us, Sid and I dug in. It took just one bite to realize that we were eating some very rich and very heavy ice cream. Of course in the ice cream world that description translates into a taste that is nothing short of delicious. You know how with some ice cream you can dig out a spoonful and you can just see the creaminess and texture in it? This is what Sub Zero Ice Cream is like. Because our vanilla and Oreo cookie mixture was so flavorful and rich, we couldn’t help but think what a chocolate type of ice cream would taste like with multiple mix-ins. This was our ice cream cup. As you can probably tell, it was very creamy. While we were impressed with the ice cream, I don’t know if it is a place we will frequent that often. Besides the steep prices, it takes a long time for orders to come out, which is semi-understandable since they are making the ice cream right in front of you. But it took us at least 10 minutes from the time we walked through the doors to get our order, and there was just one person standing in line in front of us. My photography skills are lacking in this photo because I failed to capture the intense vapor that is produced when the mixing occurs. However, you can still see a little bit of it. Also, part of the reason why I like ice cream places so much is because of the ice cream atmosphere. I love the fresh smells, the quirky décor, and the tubs of ice cream visible under the glass. 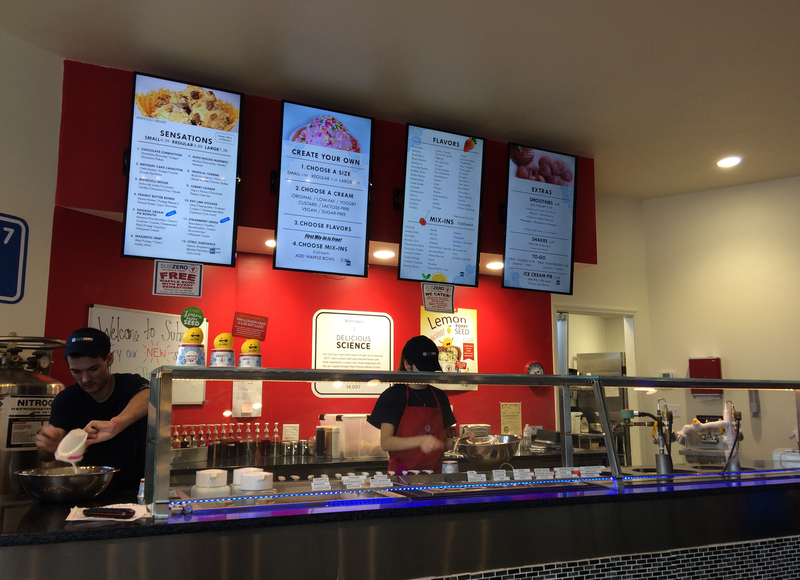 At Sub Zero Ice Cream, you obviously don’t physically see all the flavor choices because everything is made to order. 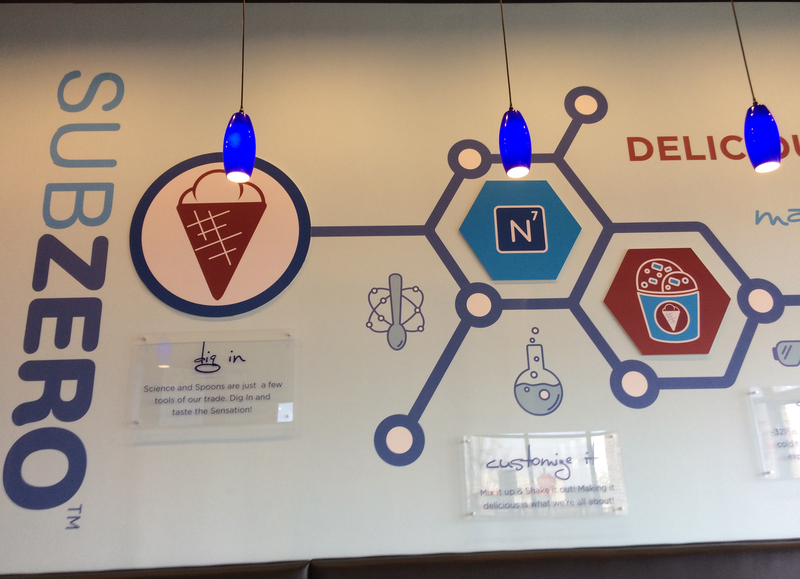 Also, the chain adheres to a science theme so instead of pleasant colors and neon signs, you have depictions of molecular formulas on the walls and liquid nitrogen tanks lining the floor area. It just doesn’t feel that welcoming. A look at one of the walls inside the Myrtle Beach Sub Zero Ice Cream location. 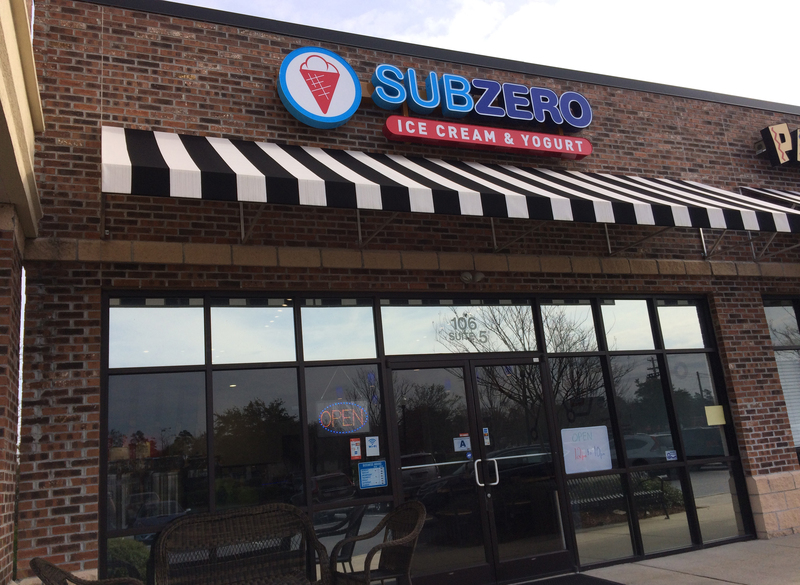 Sub Zero Ice Cream hits it out of the park with its product. However, the atmosphere, and, to an extent, the experience, just doesn’t justify me becoming a regular customer. Don’t Blink. 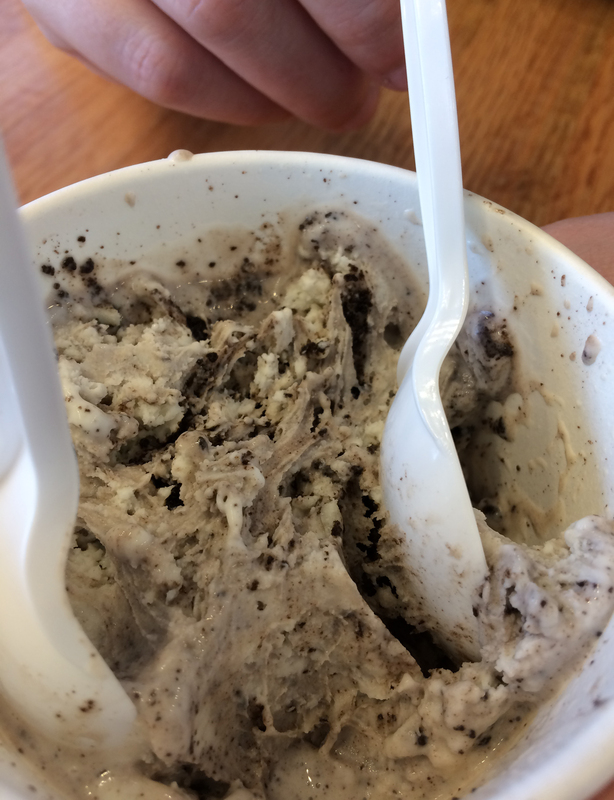 This entry was posted in Uncategorized and tagged ice cream, Ice cream in Myrtle Beach, Myrtle Beach, Sub Zero, Sub Zero Ice Cream, Sub Zero Ice Cream Myrtle Beach by brent. Bookmark the permalink.